I would never describe myself as a Yorkshireman. I wasn’t born there and only some 14% of my entire life have I lived there. Both my parents were Lancastrians and my last name is grounded in Welsh / Flemish origins. That said, I have a warm place in my heart for that English county, which prompted me to write this post on podcasting. Stay with me here. It is connected. We all know the history of podcasting, but what makes a podcast? Is it more than delivering a sound file across the web? Is it because it is in a series? Is it the length? It’s a little like asking ‘what makes a blog’, there seems to be no specific rules to qualify as a podcast. A bit like art - I can’t define it - but I’ll know it when I see it. Also like blogs, the podcast barrier to entry is technically low - and emotionally high. And by that I mean anyone can put up a blog in seconds, if not minutes. what stops people, is wondering if what they have to say or write about is interesting? What happens if nobody reads my words? Listens to my voice? The answer is real clear. Nothing. It’s not like booking a theatre and getting no audience. Tthat is a very visible miss. It takes a very particular soul to do that and be visibly rejected and then do it again. And again. But with a blog and a podcast, you can publish it and if nobody reads or listens - who knows? A public miss that nobody knows about? Who cares? But I am new to Podcasting. I have talked about not liking the sound of my own voice, but really I should just get over it. And as for whether anyone is listening, see ‘blog’ above! So, with that in mind, I have launched a podcast, which is in such early days of production, I am not even going to provide a link to the series. My point is that it can be done. And then you realize the major difference. With a blog, you open up your text editor of choice and write, you edit, you write more, you file it in a drafts folder, you come back to it and eventually one day you hit ‘publish’ and without a word suddenly your thoughts are out there in public domain for anybody to read. To some that is a scary proposition, but as I said earlier - if nobody reads it, what do you lose? But a podcast is different. Unless you understand sound files, can edit sound files, can mix and merge different sound files, you are essentially recording your self in a single take. And that is hard. Just try reading prewritten words into a microphone and see what you feel about the result. It isn’t easy. Now imagine talking like that, right off the top of your head … without hesitation, deviation or repetition . as the old BBC radio show, ‘Just a Minute’ would have. That’s difficult. I think Garageband on the Apple platform is as close to ‘Word for Sound’ as anyone has got to so far - but make no mistake, there is a learning curve. Some of this is eased when you have more than one person recording and what emerges is a conversation. A lot of podcasts take that approach. Just like theater, the monologue is powerful but oh so much harder than a production with a cast. Enter Micro Blog. I have written before about this platform, waxed lyrical even, but in a nutshell it is designed and built around simplicity. It has taken away as many barriers to blogging as it can. The only thing that stops you from publishing to Micro Blog is you. There is no other reason. My own micro blog can be found here. I use it as a thought stream for things on my mind at any given moment. It might be a link, it might be a quote, it might be a ‘tweet like thing’ … but it also aggregates all other things I do across the web. If you are following me on micro.blog, there is nothing of any import that won’t appear in the stream and in turn that stream syndicates out to the social networks I participate in. Automatically. At a stroke, I only have one place to manage, to post anything I want, about anything and the system takes care of the rest. It really is rather good. And of course, it handles images and sound as efficiently as the written word through companion apps and integrated services. But back to that issue of doing things in a single take or working through the edit learning curve. I am working that curve, and slowly getting there but as I have been doing that I have realized that I sometimes find myself stringing together lots of small sound files which got me to thinking. Why can’t one of this sound files exist as a ‘podcast in its own right’. When Micro Blog launched the service, they dubbed what you would produce a ‘MicroCast’. Yes - a play on the name - but also recognizing that recordings to share don’t have to be epic and long and meandering - they can be quick fire. Micro Blog launched Micro Monday - a neat series hosted by Jean Macdonald of Micro Blog, where each week she interviews a member of the community. We had our conversation back in December 2018. But, I have noticed that some of the Microcasts are beginning to extend in time. There is no reason why that matters, when does a MicroCast become a Podcast? Who cares. Ok - I do. A little bit. Much as it annoys me to listen to a podcast that rambles on for over two hours … seriously … you know who I am talking about, I like to think that we can keep our ramblings down. And in all honesty, Jean does a real good job of it - i THINK the only MicroCasts that I have seen go beyond 30 minutes (which is my personal arbitrary time that a Microcast should extend for), only Manton creeps above - and I have to say … that is worth it … all good and important stuff. Back to Yorkshire. Well York to be specific. When I did live in Yorkshire (for a total of nine years) York was where I lived. (Strictly speaking a small village outside of York, but anything you wanted to do outside of having a beer (I wasn’t old enough), or buying a stamp … York was where it happened. In 1983, long after I had left York, Mark Jones wrote a book called ‘A Walk Around the Snickelways of York’. Despite the word sounding like it had always existed. It hasn’t. It was invented by Mark and it kind of caught on. It’s a clever word. An onomatopoeic word. It says to me small, short, off the beaten track, not common. You have to know about it, but when you do, it opens up a veritable garden of knowledge of the town that until that point was hidden to you. A Podcast, Microcast even, that is no more than 30 seconds in length. 31 seconds means that is no longer a Snickelcast. Why? 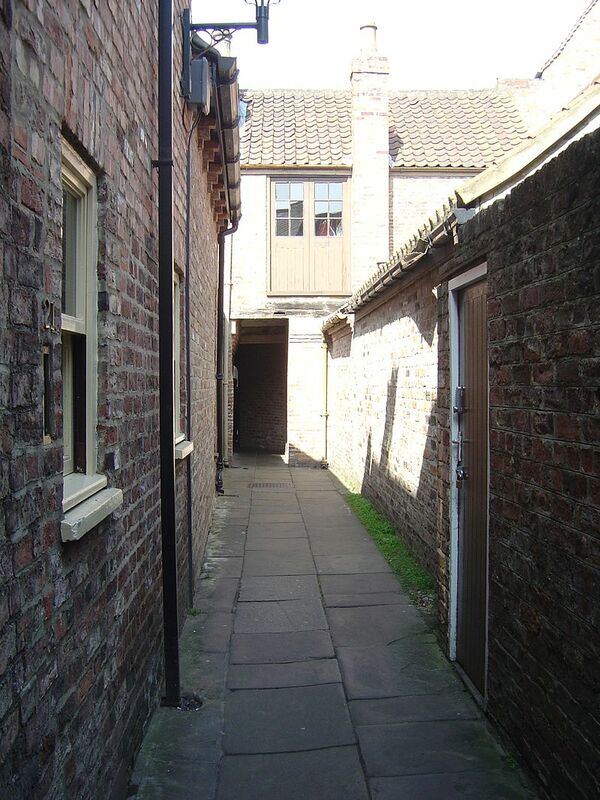 The ‘Coffee yard’ in York is at 220 feet the longest snickelway in York. At a good pace of 5 miles per hour it means that you can walk the entire length of it in just 30 seconds. Which I have decided is the perfect maximum length of time for something I am calling a Snickelcast. All Snickelcasts are no more than 30 seconds long and are Microcasts. All Podcasts are … well we still have to define that don’t we? I hope you enjoy my future Snickelcasting and of course my occasional Microcast.